A new film will underpin the South of Scotland as one of Europe’s leading mountain biking destinations. The new film, produced by Developing Mountain Biking in Scotland, charts US professional freeride mountain biker Eric Porter’s first ever experience of riding in Scotland. The Utah-based mountain biker hit the world-famous mountain biking trails and routes off the beaten track around the Tweed Valley area of the Scottish Borders. The collaborative project has been supported by the national tourism organisation, VisitScotland, as part of the See South Scotland campaign. Developing Mountain Biking in Scotland also worked with Go-Where biking tours, Cringletie House Hotel, Neidpath Castle, Borders Forest Trust and Gordon Arms to showcase the spectacular trails, landscape and experiences on offer in the Scottish Borders for mountain biking enthusiasts. The film features the stunning scenery of the Tweed Valley, from St Mary’s Loch to Glentress Forest, as well as the undisturbed dark skies to the historic sites that can cross a mountain bikers path in the region. In his first ever visit to Scotland, Eric talks about the accessibility of the area, but describes it as ‘feeling like the middle of nowhere.’ The film shows the group of mountain bikers tackling the trails, as well as experiencing a night in a remote bothy and sampling Scottish food, such as cheese and haggis. Ed Shoote of Developing Mountain Biking in Scotland said: “It has been a fantastic to host Eric and have the opportunity to make this film in the Scottish Borders. Eric has mountain biked all over the world so it was awesome to hear him rave about our mountain bike trails but we also wanted to showcase the culture and sense of history that makes a trip to southern Scotland so special. 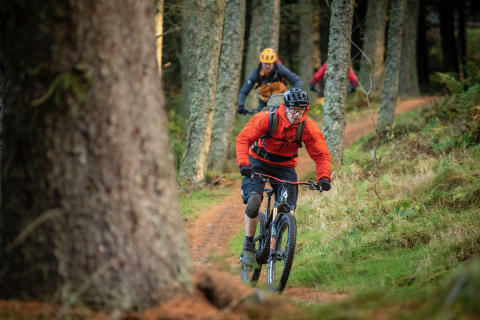 Many mountain bikers head straight to Glentress so it was great to show with Go-Where Scotland that there is so much more to explore in the area. VisitScotland Regional Leadership Director Paula Ward said: “We were delighted to support the production of this film to showcase the Scottish Borders as a world-class destination for mountain biking. The South of Scotland has long been recognised as one of the world’s leading locations for mountain biking thanks to the creation of the 7stanes network of trail centres located in Innerleithen, Newcastleton, Ae, Dalbeattie, Kirroughtree, Glentrool and Glentress. Thanks to partnerships with global riders we will continue to build on this success. 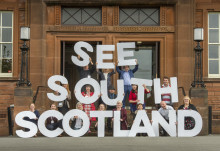 The See South Scotland campaign was launched in October 2018 and will promote the south of Scotland as a tourism destination to key UK and European markets, focusing on coastal and forest activities in particular. 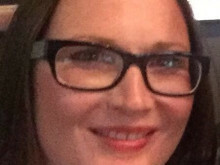 The £500,000 funding from the Scottish Government will target potential leisure visitors from key domestic and international markets, encouraging them to visit the South of Scotland as the main driver for their visit to Scotland through the development of online content, foreign press trips, partnerships and digital marketing campaigns.